The very first Slovenian "Hernia International" Expedition was supported by the United Kingdom based Hernia International organization. They travelled to Gambia to perform hernia surgeries and teach the Gambian surgeons new techniques. The team included the anaesthesiologists Eva Pogačar and Urška Bricelj, resident of obstetrics and gynaecology Luka Kovač, medical student Selena Benedik and surgeons Tomaž Benedik and doctor Jurij Gorjanc, who also lead the expedition. GoOpti organized the transfer from Ljubljana to Venice Airport for all the doctors with their equipment. First they flew to Barcelona and then to Banjul, Gambia. Being on a humanitarian mission doesn't mean you can't experience real traveller's complications. "Our extra luggage was lost and arrived at the hospital in Farafenni in the evening of our third operating day," said doctor Jurij Gorjanc. The team had to work with the supplies they packed in their hand luggage and whatever materials and medicine the hospital and the hospital pharmacy had at their disposal. After a warm welcome in Banjul by the Gambian Health minister dr. Omar Sey the Slovenian doctors drove to the Gambian city Farafenni on the border with Senegal. The next day they started their 5-day operating marathon. They were operating from 8 a.m. to well past 8 p.m. every day and performed 63 surgeries on 57 patients. A third of the patients were children. None of the patients had any perioperative complications. The team of doctor did not only help the patients but also took their time to pass their surgical knowledge to their Gambian colleagues. They learned a lot from the Gambian team as well or as doctor Gorjanc said after gaining some insights in the Gambian way of work: "Many details of the surgical procedures can be simplified without a risk for the patient and are less challenging for the operating team. Medicine in our home countries is definitely very sophisticated, which is good and necessary, but perhaps it is also too complicated in some ways?". Upon arriving back to Venice Airport, the six doctor were full of memories as they sat into the GoOpti van. 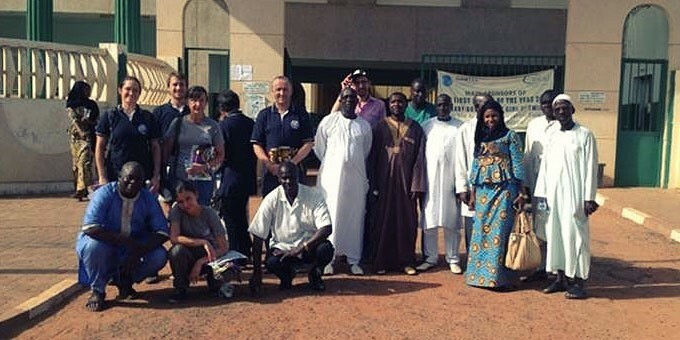 "We thank GoOpti that helped us with their professional approach and generosity and provided us with transfer to and from the airport," doctor Gorjanc said, adding: "What remains in the long term is our gratitude towards our Gambian hosts and our plans for future expeditions." They hope they will travel East in 2017. To Nepal. GoOpti will gladly help them again. You can see more expedition photographs in our Facebook album.